I'm Here. I'm Queer. What the Hell do I read? : Hannah's Summer Adventure: Our First Summer Internship Was A Great Success! Hannah's Summer Adventure: Our First Summer Internship Was A Great Success! I am extremely sad to see that summer is ending. 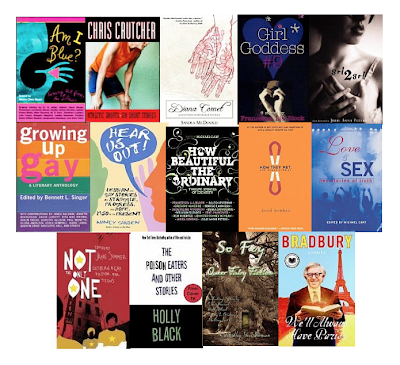 It means that I have to go back to school and that we have reached the end of the Summer GLBTQ Teen Short Story Bookshelf. This past summer, we have covered 14 anthologies of young adult short stories. It's crazy how fast it went! Some highlights of mine include How They Met by David Levithan and Diana Comet and Other Improbable Stories by Sandra McDonald. When I look back to my first post in July, I remember the anticipation I felt. I was so excited that all of my work was finally going to be seen, but at the same time I felt like an outsider. I was scared that if I misused a certain word or didn’t word a summary the right way, I would come off as offensive. I struggled through my first assignment, highlighting and erasing a section every 10 minutes. However with the help of your supportive comments, the amazing Lee Wind, and the beautiful characters in all the stories that I read, I began to feel more and more self-confident and a part of a community. This year I am even joining my school’s GSA. I cannot tell you how much your comments have meant to me. Thank you so much for reading my posts and have a great year. Thank you, Hannah, for doing such a great job with these GLBTQ Teen Short Story Anthologies and Collections! You rock, Hannah, good luck with everything that comes next. Best of luck to you, Hannah! Such a great post. Good luck to you, Hannah!